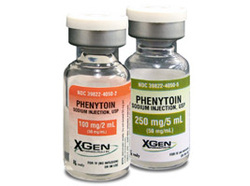 Phenytoin is useful in treating status epilepticus, grand mal seizures, generalized tonic clonic seizures, simple partial seizures and complex partial seizures. Phenytoin may affect other drugs due to its ability to induce cytochrome P450. Phenytoin may lead to an increase in the metabolism of few drugs such as cyclosporine, warfarin and oral contraceptive pills. Phenytoin may reduce the depolarization of the neuron by decreasing the flow of the calcium ion and sodium ions across the cell membrane of the neuron. Phenytoin may lead to hirsutism, instability of the gait, megaloblastic anemia, double vision, neuropathy, hyperplasia of gingival, nystagmus and rash. Phenytoin may be associated with fetal hydantoin syndrome. Fetal hydantoin syndrome is associated with congenital palate malformation, prenatal growth deficiency and congenital cardiac anomalies. Phenytoin is also a drug induced lupus.